Our range of products include dell wyse 3020 thin client, dell wyse z90d7 thin client, dell wyse thin client, dell wyse c10 thin client, hp t5740e thin client and hp t5740 thin client. Warranty Three - year limited hardware warranty. Audio Composite audio jack 1/8 - inch mini, 16 - bit stereo. Internal mono speaker. Mountings Horizontal stand. The same stand can be used for VESA wall mounting. Establishing a new performance standard in its class, the Dell Wyse 3020 Thin Client provides an exceptional user experience at a highly affordable price. It features a dual core ARMADA 1.2GHz System-on-Chip (SoC) along with abuilt-in hardware media processor and delivers smooth imagery, bi-directional audio and flash playback performance. The 3020 thin client offers great functionality with support for up to two digital displays, a dual-band WiFioption and Microsoft RemoteFX certification for high-end graphics. The Wyse 3020 thin client arrives ready to connect to Citrix, Microsoft, VMware, and Dell Wyse vWorkspaceright out of the box. It is available in two virus-resistant firmware configurations -as a Citrix zero client with Wyse Thin OS Lite, or as a thin client with Wyse Thin OS. IT won’t need to visit or touch Wyse 3020 thin clients to manage them as they can be managed remotely with Wyse Device Manager (WDM). WDM offers remote enterprise-wide management that scales as you grow from just a few to tens of thousands of endpoints. Designing smooth playback of high bit-rate HD video and graphics in such a small box hasn’t been at the expense of energy consumption and heat emissions either. Using just 7 watts of electricity earns this device an Energy Star V5.0 rating. In addition, the 3020’s small size enables discrete mounting options: under desks, to walls, and behind monitors, creating cool workspaces in every respect. One DVI-I port, DVI to VGA (DB-15) adapter included.One DVI-D port.Native dual digital display support with DVI-I and DVI-D ports.Four USB 2.0 ports, 3 in front, 1 in back. 10/100/1000 Base-T Gigabit Ethernet.Optional 802.11 a/b/g/n internal wireless, dual radio and dual antenna @ 300 Mbps. Single: up to 1920x1200 mm, 60Hz; color depth: 8, 16, 25, or 32 bppDual: up to 1920x1200 mm, 60Hz; color depth: 8, 16, 25, or 32 bppDual monitor supported with display rotation (“L shaped” displays)VESA monitor support with Display Data Control (DDC) for automatic settingof resolution and refresh rate. Security protocols supported for both wireless and 802.1x network basedauthentication: EAP-TLS; EAP-LEAP; EAP-PEAP, EAP-MSCHAPv2, EAP-GTC;WEP; WPA Personal; WPA2 Personal; WPA Enterprise; WPA2 Enterprise. Worldwide auto-sensing 100-240 VAC, 50/60 HzEnergy Star V5.0Phase V external and EuPcompliant power adapterAverage power usage with device connected to 1 keyboard with1 mouse and 1 monitor: under 7.2 watts. Ergonomics: German EKI-ITB 2000, ISO 9241-3/-8Safety: cULus60950, TÜV-GS, EN 60950RF Interference: FCC Class B, CE, VCCI, C-TickEnvironmental: WEEE, RoHS Compliant. 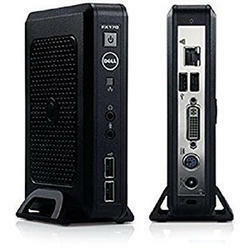 The Dell Wyse Z90D7 Thin Client brings unrivaled high performance to users demanding more from their virtual desktops. Windows Embedded Standard 7 operating systems, and a cloud PC. Fast processing Accelerated graphics and multimedia. Fast and flexible user connectivity. Excellent energy-efficiency. From the instant the new Dell Wyse Z class – the world’s first self-configuring windows-based Thin Client boots up – it delivers everything that today and tomorrow’s users need in order to tackle the most demanding of virtual desktop environments. At its heart beats the very latest single or dual-core AMD G-Series Accelerated Processing Units or APUs, where all the processing, graphics and HD video tasks are performed on the same piece of silicon. Giving a dramatic leap in user experience and the ideal platform to reap the benefits of Dell Wyse cloud, Virtualization, and Management software. Display, manipulate and work with stunning high definition multimedia graphics, voice, and video in virtual desktop environments that are ready for Unified Communications. That’s the promise the Dell Wyse Z class more than delivers on, with great performance across 2D, 3D, and HD video applications. Its new design takes them all in its stride and is the first to include hardware accelerated DirectX 11 graphics with OpenGL 4.0 and OpenCL™ support. Throughout its long lifespan, the Dell Wyse Z class has the least possible impact on working environments and energy consumption. Its low energy processor out-performs other more power hungry alternatives, while minimal heat emissions permit a fan-less design that lowers power requirements. It all adds up to an advanced high-performance Thin Client that’s compliant with the Energy Star. Mountings Vertical or Horizontal (optional), VESA mount. The Dell Wyse Thin Client family of thin clients combines power, expandability and display performance with the legendary security, reliability, and manageability ofWyse Thin Computing. Designed to maximize your investment in thin, virtualized or zero client environments the Wyse R class family presents a compelling solution to delivering low cost, low carbon, high-performance desktops. The Wyse R class family features powerful processors, dual monitor support, fast graphics and a host of USB ports for those vital everyday peripherals. Perfect when you need a client capable of voice, data, and video. The new Wyse R class features high performance central and graphics processors coupled with full support for multiple screens and the best PC experience available on a thin computing platform with the Wyse TCX Suite of virtualization software. 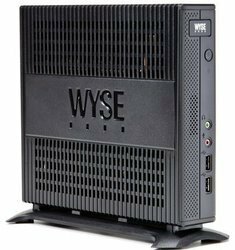 Wyse R class thin clients are supplied as standard with feet for vertical use. 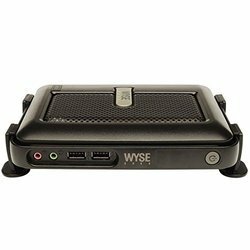 Optional feet enable Wyse R class thin clients to be used horizontally. An optional VESA mount bracket enables Wyse R class thin clients to be mounted on the back of a monitor or on a wall (this requires the four industry-standard mounting points to be free). The same bracket can be used for wall mounting, or in a secure or ruggedized cabinet if required. Owing to the rich industrial experience and expertise in this business, we are involved in providing a supreme quality array of Dell Wyse C10 Thin Client. 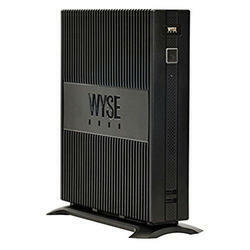 Wyse C class thin clients are available across a variety of operating systems featuring the speed of Wyse ThinOS, the functionality of Microsoft Windows CE, the versatility of Microsoft Windows XP, the advanced capabilities of Microsoft Windows Embedded Standard and the provisioning power of Wyse WSM. Inside every compact, Wyse C class lies a punchy VIA C7 1 GHz processor and an advanced hardware graphics accelerator delivering rich multimedia and video playback up to 1080p HD resolution. Outside, you’ll find advanced DVI-I display connectivity for one or two displays, four free USB 2.0 ports, PS/2 ports for keyboard and mouse, Gigabit Ethernet and optional WiFi (b/g/n) support. On the desk or out of sight; Wyse C class fits around you. Every Wyse C class includes a monorail mount that lets you choose how and where to fit it: horizontally, vertically, directly to walls, under desks ...and even fitted discreetly to the rear of standard desktop displays. Creating highly productive, fully functional and compact virtual desktops has never been easier. Each Wyse C class features full support for these TCX™ Suite of user enhancements - that includes multiple display support, multimedia playback, rich bi-directional audio, Flash acceleration, and USB peripheral connectivity - and Wyse WSM™ zero client provisioning software delivering a PC experience on a thin or ‘zero clients’. Designing these levels of high processing and graphics performance in such a compact space hasn’t been at the expense of energy consumption and heat emissions either. Each Wyse C class draws under 7 watts of power - creating cooler working environments - in every respect. Three models are available featuring Wyse ThinOS, Windows CE, Windows XP embedded & Windows Embedded Standard operating systems - and a zero client model for Wyse WSM provisioning software. 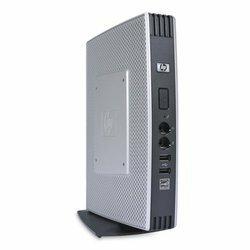 Packed with the latest technology, the HP t5740e Thin Client delivers true PC performance, flexible expansion, and reliability in client virtualization environments. The HP t5740e combines the Intel Atom N280processor and GL40 chipset, DDR3 RAM, and native dual-monitor support with VGA and DisplayPort connectors for impressive price/performance. The low-power HP t5740e meets stringent ENERGY STAR®requirements and complies with the EU’s EuP Directive. Easily extend the life of the system with a simple memory upgrade in the open RAM slot or add-in cards to the optional PCIe x4/PCI Expansion Module. Connect a variety of peripherals with eight USB 2.0(including two in a securable compartment) and legacy ports. Use the standard Gigabit Ethernet or choose the integrated wireless. Make the most of your workspace by using the HP t5740e in a horizontal or vertical position, mounting it under a desk or on a wall with the optional HP Quick Release, or adding the HP Integrated Work Center Stand for all-in-one convenience. Quickly deploy familiar, reliable computing experiences and enjoy enhanced security and easier management. Feature-rich Windows Embedded Standard 7combined with industry-leading software from HP, Citrix, VMware and more deliver PC-like experiences in a variety of virtual desktop environments. Pre-loaded with HP's innovative management offering for SMB to the enterprise, HP thin clients can be easily managed from a single console, freeing IT staff from common PC break/fix and help desk tasks and leaving more time for strategic IT. With the HP t5740e thin client at the desktop, a disproven portfolio of desktop-to-datacenter hardware, software, and services will help you create a thin computing solution that improves your IT and user experience. You can also select from a range of HPC are Pack Services to extend your protection beyond the standard warranties1. For more information about the HP t5740e thin client please visit www.hp.com/go/thincomputing. The Optiplex Thin Clients is the lightweight, simple system ideal for use in the knowledge-based or multimedia environment. Enjoy the security, flexibility, and manageability you have to come to expect from Optiplex desktop in this thin client solution that uses minimal power. Comes standard with ThinPC support and simple, quick hardware issue resolution with easy replacement.